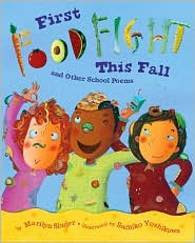 In Marilyn Singer's forthcoming First Food Fight This Fall and Other School Poems (Abrams, 2009), we first meet a group of kids destined to become Ms. Mundy's class--each unique even in the way they mount the steps onto the bus and take their seats. Laksmi shyly hides behind her hair, while Dylan clicks a mental photograph of the noisy gang's first ride to school. As the year goes forward, Singer crafts 29 engaging and endearing poems by one or more of these students, chronicling not only the familiar milestones--squabbles and games, holidays and first snowfall, tests and triumphs--but each child's passage through the trivial and momentous days of their lives. And like Dylan's mental click, each child is caught in a verbal snapshot as each grows through the year. on the last outdoor recess of the year. Tell me that you won't be mine! Please don't be my Valentine! last chance to get caught. First green beans to pick. first "Look, it's still light!" Singer's simple poems are surprisingly moving, written in various styles--quatrains, blank verse, haiku--capturing the individual voices of the kids of the class. Great for occasional poetry breaks, for the beginning and end of the year, or as a jumping-off point for classroom poetry study and writing, this slender book deserves a place close at hand on teachers' desks year-round. Sachiko Yashikawa's ebullient illustrations catch the humor and pathos, the ups and downs, of the school year just right, and every child can find himself in these short poems that capture the elementary school experience like a treasured photo album.